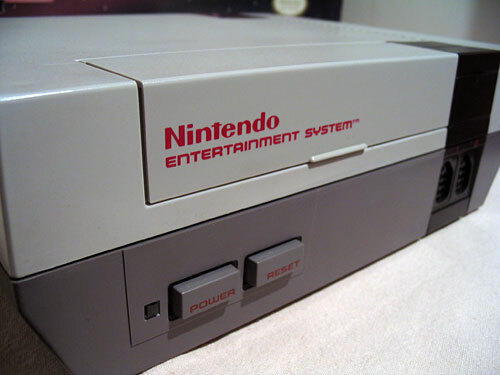 I was one of those kids that got an NES system for Christmas in 1985 – the first year of its release. The funny thing was I didn’t ask for one, and I didn’t even particularly want one – my mom just knew it was the “hot toy” of that year, and she knew I’d been a fan of game consoles since the original Atari VCS, so she assumed it’d be the perfect gift. What she didn’t know was that at that point, I’d moved on to playing games on my Apple IIc, and I felt like the NES was for children (same argument you hear about Nintendo today). Anyway, I appreciated the sentiment, and I kept the system around and even got a few games for it, but I didn’t play it much. In fact, I eventually sold it when I went off to college. No, that is not my original NES pictured above – it’s a replacement. I always felt bad about selling it, though, and I got bit by the nostalgia bug eventually anyway. (It also became obvious to me at some point that the NES did have quite a few great games.) I decided to seek out the exact system package I’d sold – and in fact, for all I know this is my original system. 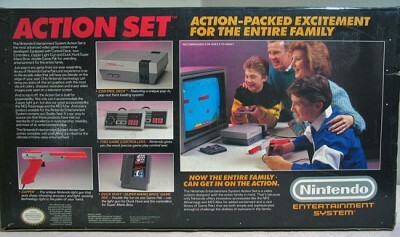 It is the same set (the “Action Set”) and it includes the box, all manuals, even the original Nintendo poster catalog. It is in about the same condition (i.e. mint, barely used) as mine was when I sold it. 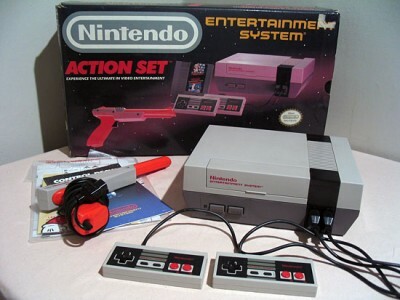 The Action Set was, I believe, the second NES package released, but the first widely available. Prior to this, Nintendo offered a package including ROB the robot in the New York area – the Action Set was released as a lower-cost alternative and became the standard set for a while. It included two gamepads, a light gun, and the Super Mario Brothers/Duck Hunt cartridge. It’s hard to believe the NES was released more than 30 years ago (I originally posted this in 2005, but it’s now 2016!). It does seem like a different era than the Atari VCS, Intellivision, Colecovision, Atari 5200, even the Atari 7800 (though the 7800 actually was released after the NES!). You can already see the change in the industry; the marketing, the sales imagery, everything is looking much more modern and refined. It’s hard to believe the NES and Atari 5200 were only released three years apart, they seem so different… yet if you look at Nintendo’s marketing for the NES 20 years ago, it’s not all that much different than what you see from them today. 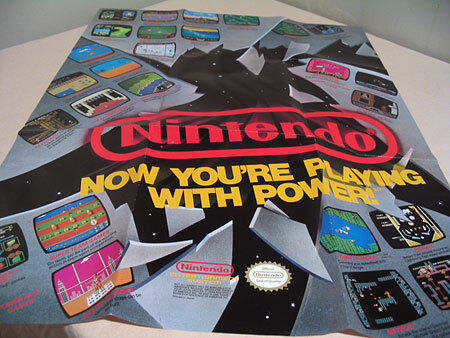 The NES was definitely the start of the modern era. I love the NES dearly, I have COUNTLESS cherished memories playing it with friends and family. I actually feel right now virtually the same way about consoles as you did back in 85′. That PC provides a much better gaming experience then consoles. Over the last 8 years there have been only a handful of console games I have enjoyed (mostly Nintendo games), and countless PC games. The 360 only has Dead Rising, which is awesome. But Mass Effect & Gears have made there way over to PC. The NES may have selled better in north america but in Europe it sold poorly I believe along with many other SEGA fans that the SEGA master system was supirior in that it had better graphics for the most part and great games like OUT-RUN and Afterburner. My family were very poor and we couldn’t buy very much toys. I was 8 or 9 years old. My friend which was our neighbor were very rich and he had a lot of toys. They lived in a building with 4 floors and one floor of their building was full of toys. He had his own Atari with pac-man which I had played once and I thought I will never have such beautiful game in my life..
My father who was a very honest and respectable man, he had helped someone very much and that person wished to thank him in some way and gave me the Nintendo as a present. The day that I received the Nintendo, I was the happiest child in the world. It was the best day of my life.. I remember I played Super Mario bros with my little brother, who couldn’t jump the first hole so I had to play Mario and Luigi instead of him all the time.. I love these memories. My father, the most honest man in the world, My mother she was my teacher and friend at the same time. my lovely brothers..
Why today parents divorce so much? Why brothers are afraid to hug each other? What happened to the fathers who taught intelligence to their sons? Did I dreamed everything? I clearly remember the bright sun and the love songs and the humanitarian values..
Where are these? I open my eyes and I see destroyed families and divorced parents. Turn on the TV or walk in the streets and see all these gay people everywhere. And now they are becoming Shemales and Bisexuals. The clean beautiful bodies have become full of tattoo and piercings. Where is the voice of Whitney Houston? What happened to Michael Jackson’s dance? Now we have some idiots playing like monkeys. MTV love songs are dead.. Disney Classics are dead..